2. The tendency to invest in detail. The movie sets up all the characters that surround Pooja with a series of humorous, collage-esque, snapshots. Sort of like Cranford crossed with Clueless. Or a pleasant short story you read at the coffee shop on Saturday morning. You might question the overemphasis of quirky town-staples, except that these characters collectively make up the heroine's psyche. Pooja's father and aunt, more than anyone else, bridge the divide between sketch and home video. But BECAUSE OSO spends so much of it's relatively short runtime with secondary characters and Pooja's limited first person perspective, we never really get to know Giri beyond his reputation. We know Pooja intimately (or as well as we can know her in a film trying to be a bit tongue-in-cheek), and we see her build a rapport with multiple side-characters, but all of this only casts a brighter light on the lack of a rapport between the "lovers." 3. The attempt at showing long lasting platonic relationships between men and women. Good, but underdeveloped, just like the romance. Also, one of the reveals sours this theme... and you end up feeling that one of the friendships was just a red herring. 4. The idea that everyone experiments with life, and sometimes it takes a while to find the right recipe. It's hardly a subtle theme. Pooja's aunt is a specialty winemaker always mucking about in the cellar with a different brew, her father is an amateur chemist trying to discover a miracle drug, her mother is a cooking fanatic and is always trying to perfect new recipes. All of this should add up to a film that recommends experimentation--and I think it tries. I *think* we're supposed to realize that there's a time to experiment and wait, and a time to just go all out and order exactly what you want off the menu. 5. The runtime. As much as it's nice to see a film that isn't weighted down with excess and flash, we couldn't everything we wanted in the film because it was too short. Yes, at two hours with only a couple musical sequences (which are definitely not big performance numbers), somehow OSO doesn't have enough time to pull off a satisfying romance. Or maybe it veers off formula too much and then doesn't know how to get back to the main road. Nothing substitutes for relationship-building. Aiyyaa manages to make me feel as if the two leads will get along splendidly once the conversational barrier is finally broken near the end of the film...most probably because it breaks its own limited (if fantastic) perspective once or twice to show us a glimpse of what the object of the heroine's desire really thinks of her. Even with more dialogue in Nivin Pauly's hands than Prithviraj ever got in Aiyyaa, and certainly a role with clearer motivaions, I can't get away from the feeling that Giri and Pooja might actually be mismatched. It's not that he's poor and she's rich, he's Hindu and she's Christian, vagerah vagerah, but that I don't see anything but respect between them. And sure, respect is SOMETHING, but their vastly different daily jobs and interests (so painstakingly set up) might prove to be a bigger hurdle than any differences in social status. YouTube video with a disabled comments section, the film puts forth a semi-feminist and pluralist ideology with a happy-go-lucky spirit, inviting no internal criticism. Still, it seems quite remarkable in its devil-may-care approach to female-empowerment, parenting, inter-caste and interfaith relationships, and dowry critique. For me, the best moments ebbed and flowed with the presence of Pooja's father (Renji Panicker), an absentminded doctor, and also the film's clearest moral voice: especially in the themes of hands-off parenting and religious pluralism. Despite her sometimes reckless ways (especially in his community's eyes), he never rebukes his daughter EXCEPT when he feels she is being untrue to herself (in her quest to get the boy she wants). And no matter what she asks for, he gives. Perhaps indulgently, but also as a vote of confidence. And *spoiler* to the end, he's proved right in his assessment of her character. I guess this is one of those dishes that's missing something, but definitely worth trying on your way to something better. Note: If there's one, single, unmissable moment in this film, it's Pooja's fantasy of a potential groom viewing (instead of the usual bride viewing scene), with Nazriya literally reversing the masculine gaze and Nivin playing the bashful candidate serving tea to the visiting family. It's not that Pooja doesn't retain something nearing this agency in the rest of the film, it's just that I cared about it more in the guise of farce than dumbed down into a formal drama. Saw it on the flight back from India in October. Wasn't too impressed with it simply because it was too pretty-pretty and didn't make me invest any emotion in a relationship which was rather cold. Yeah, it's frustrating because I've heard a lot of raving about it--and I felt it could have been a lot better with just a couple of scenes added to set up a WARM relationship between the two. Great analysis there. I totally didn't see the experiments with life theme until I read your post !! t think for me, the power of a female narrator simply overpowered the disappointment due to any lack of chemistry between the leads. In fact, I found it refreshing that a normal feel good movie tried to be charmingly careless about the love affair. Rani and Prithviraj in Aiyaa were brilliant, but I am really glad that in OSO, it seemed like Pooja would be just fine, if a tad bit disappointed in case she could not win Giri over. About the underdeveloped platonic relationship theme, let me just say I've sat through Tamil movies which basically hammered out the message of platonic friendship (by making EVERY CHARACTER talk and SING about it) so I am very glad it was not developed much. But now I am wondering, has there been a decent, casual and not trying to prove a point friendship between the opposite sexes showcased in Indian cinema ? Do you have a top 5 list handy ? You are perfectly right to take the "female narration" aspect as your trump card. It really is the main reason to watch the film, along with the fact that she could handle rejection, as you said. It's definitely not one of those stories where the girl only has her love and nothing else. She has a life and then tries to create something else on the side ... which is far more like a world I recognize. On platonic relationships in Tamil movies ... that's hilarious. I need to see one of those. I've seen so few in Hindi. Platonic friendships... I feel like the romantic leads aren't portrayed as having time for them, unless it's to showcase an unrequited love? The ones that come to mind between main characters are Zeenat and Vinod in Qurbani (which is like a undeveloped romance), Sanjeev and Mumtaz in Aap ki Kasam (which turns out BADLY because hubby gets jealous), Sharmila and Barun Chanda in Seemabaddha (which is almost more of a challenge/response relationship), Hema's Geeta with Dharmendra in Seeta aur Geeta (which does feel very friend-y, platonic to me), and then anomalies like Kangana's three platonic male friends in Queen. Not really a long list. If you add secondary characters, there's probably a lot more, tho, don't you think? I can think the ones played for a gag ... and maybe a few played as mentor-mentee relationships, or benefactress-bechara hero. 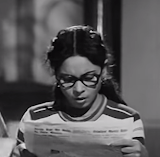 Any idea why it is so prevalent in Tamil cinema? Ah, the Hema and Dharmendra in Seeta and Geeta example is perfect ! Exactly what I was looking for. Some really nice showcasing of platonic friendship there. Completely slipped my mind. This theme is not *so* prevalent in Tamil Cinema (might have misled you a bit there :P) but there seem to be quite a few directors out there who want to lecture to the audience that FRIENDSHIP IS NOT LOVE (in caps). I’m From Tamil Nadu, I like Malayalam Movies very much, in contrast I heard many Malayalam people like VIJAY, AJITH, SURYA, ALLU ARJUN. Tollywood is completely opposite to molly wood, whereas kolly wood is mixture of both the tolly wood and molly wood. Movies Made by Malayalam Industries are heart warming and life oriented, where you can at least learn something for your Life. I wish People from Malayalam film industry release their movies in Tamil with subtitles so that it will reach wider audience. Because artistic work should reach more people in the world. I used to read all the malayalam cinema news From this site, check it , would be useful.